Dental implants look, feel and work just like real teeth, explain the dentists at Smile Essential in Leicester. They are ideal for replacing missing teeth and can be used to secure a bridge or denture. Tooth implants are small metal screws that replace the missing root of a tooth are placed in the jaw so that crowns, bridges and dentures can be fixed onto them. Have you lost all or some of your teeth? Implants in Leicester can help! Our patients are delighted to hear that bridges and dentures are no longer the only solution to replacing missing teeth, thanks to advances in modern dentistry. Implant dentistry offers a clinically proven and safe solution to restoring your smile and being able to bite and chew with confidence. When you lose your natural teeth, your jawbone and surrounding tissues start to disappear over time and this can lead to a 'caved-in' appearance. 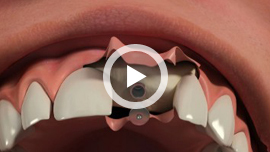 When implants are placed in the jaw, it stimulates the remaining bone to grow and this helps boost the way you look. More importantly, oral implants help restore function so you can eat, chew, bite and socialise with confidence - without the fear that your dentures might fall out or having to stick to a soft food diet for the rest of your life. Restore your taste, your smile and your confidence with dental implants in Leicester! Dental implants are widely recognised to be the most successful method of tooth replacement used today and it is hard to tell them apart from your natural teeth. They are an investment but as a long lasting solution, what price can you put on being happy, confident, sociable and able to eat the foods you like and enjoy? Dental implants are accepted by dental professionals for over 50 years as a successful and trusted method of tooth replacement. They act like your natural tooth root. You do not feel the difference. Implants are made of biocompatible materials. As a result, they are accepted by your body. They provide stability and comfort, for a wide variety of replacement teeth solutions including single crowns, bridges and dentures. Maintain natural bone, and minimise further bone loss due to bone stimulation – one of the most important advantages. At Smile Essential on Narborough Road we completely understand the problems that result when teeth are lost. If you can associate with any of the following issues, please get in touch. We offer a free consultation for dental implants, so, if you are considering this treatment and would like to find out more, please contact us today to book.